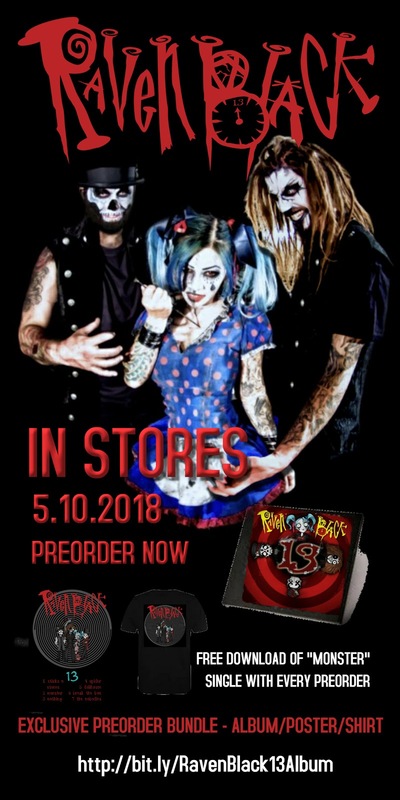 LA-based Theatrical Metal Band RAVEN BLACK has announced the pre-order launch for their highly anticipated 2nd album, 13. The incredibly visual quartet has also released the pre-order for their debut comic book, A Dark Metal Carnival: The Beginning and has begun booking their Spring tour set to launch in May. “Monster” is available to stream NOW on Spotify and download on iTunes. The Hex O’Clock Tour was a complete success and the band was able to visit so many new cities throughout the country, see their fans and play so many new venues. Sharing with their fans, new stage props, a few new songs and announcing their new album 13 in early Spring 2018. To end the 2017 year, Raven Black just announced their Preorder of the Comic Book – The Dark Metal Carnival – The Beginning – Issues 1-100. These pre-order comic books will be series sequenced from 1-100 and will release in print this Spring 2018. Only these first 100 issues will be numbered for the fans that preorder. The remaining prints after the first 100 will not be numbered. Who will they be touring with this Spring? It’s still a secret but one worth the wait! Stay tuned for the upcoming Tour dates!